College is hard, y'all. Denise is having trouble in three of her classes, and her parents have to coach her on how to structure her time and write decent papers and overall stop being a bad student. In other news, Rudy has to accept being cast as The Wind in her dance recital even though she believes that she is The Sun. 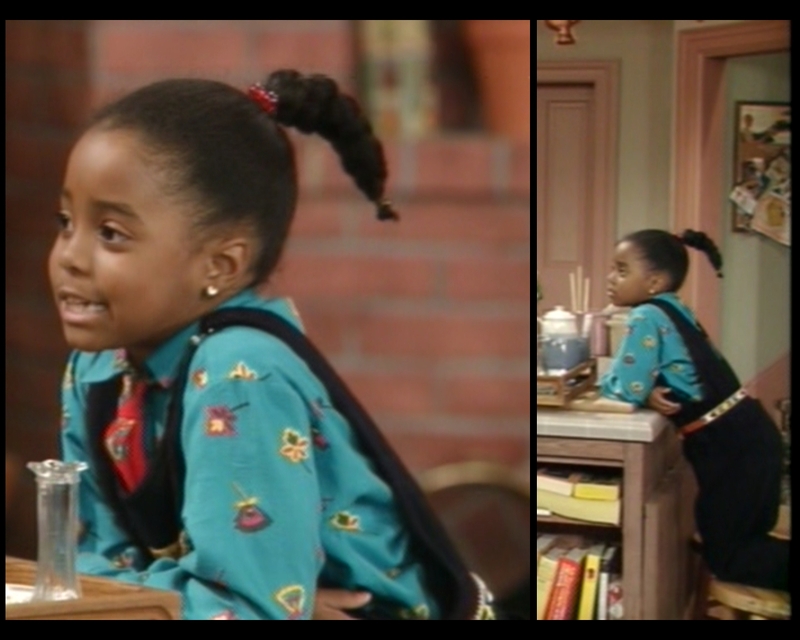 The Huxtables have a lot of First World problems. She got her Ph.D. in incredulity. Beginning with guest stars, as we do, I'll introduce you to Rosalind Cash as Dr. Hughes, Denise's literature professor. Her theatrical background gave her a grounding in the classics, though her work there earned her little public notice. After finding fame starring opposite Charlton Heston in The Omega Man, she took on a diverse array of jobs, from guest spots in mainstream sitcoms like The Mary Tyler Moore Show to leading roles in blaxploitation films like Amazing Grace and Dr. Black, Mr. Hyde. 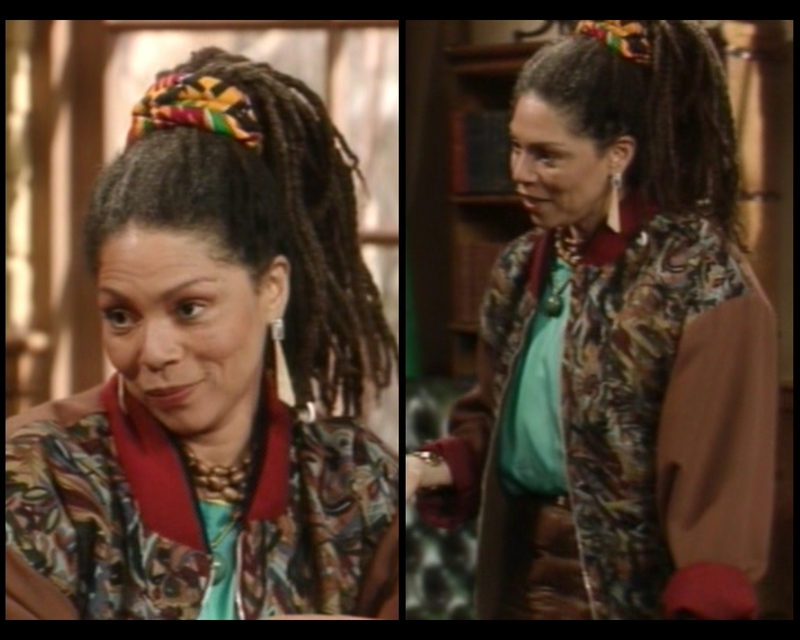 She also worked with Bill Cosby on two movies: Hickey & Boggs and Uptown Saturday Night. She continued to appear regularly in television after this episode aired, including reprising the character of Dean Hughes regularly on A Different World. Sadly, she lost her battle with cancer at the age of 56. She's dressed to convey a clear viewpoint here. 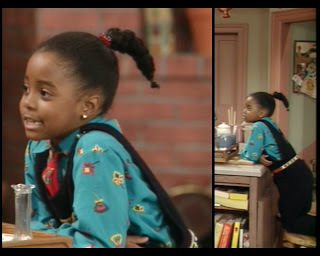 After giving Denise a low grade and threatening to fail her if she doesn't improve, Dr. Hughes could easily come across as strict to the point of cruelty. To bolster the actor's natural charisma, however, the costume department has avoided stuffy suits and rigid professional attire in favor of a more colorful, less conventional approach to work clothes. She's delivering a lot here in terms of palette, veering from the sunny wrap in her hair to the bold teal of her puffy blouse to the crimson accents on her coat. The jacket also serves up some subtler shading in the leafy print along the torso. Personally, I'm not inclined to validate any of this as fashionable or attractive. It's too much, and needs to be toned down significantly. The coat alone is competing with itself, and then the shirt, headpiece, and jewelry all struggle for attention on top of it. The message that she's a cool teacher could have been conveyed just as effectively with a more tasteful look. She goes past "fun" and into "unhinged" in this getup. You know who else makes a guest appearance? Yep, Sondra. Wearing this. We had been getting along so well, too. I want to be able to like her, but look at that jacket. How am I supposed to let that fly? The material couldn't look cheaper, and the color washes her out like a corpse. The collar is too wide and has asymmetrical notching that makes me want to turn my computer off and run away. The shape destroys her shape. One good thing about the jacket: it obscures the rest of her outfit. Not for long, though! Once it's off, Sondra reveals that she's made a full-speed, unrepentant return to her Hostess-at-a-Tex-Mex-Restaurant phase. This shirt is the worst. While I blamed the orange for making her look dead, I think the rancid butter shade of this garment might be equally at fault. It's tent-shaped, detailed with an impossibly tacky print, and adorned with a creatively heinous pin. But let's not let the top take all the abuse: those pants are equally problematic. They appear to rest literally above the bottom of her rib cage, and then immediately billow outward (supported, naturally, by liberal pleating). Her appearance earlier in the episode leads one to believe that these are normal, if somewhat drab, slacks, so it seems that the cut of the legs isn't atrocious. Somehow, though, everything from her pelvis upward becomes an ocular assault. Why couldn't she have stayed with the forces of good? We're losing allies, gang. It pains me to list Denise among the guest stars, but the truth hurts sometimes. I'm starting with this picture merely to answer my own question from episode #2.4: yes, these are pajamas. Going through a goth phase? Her look during most of this episode is pretty bland in comparison to her previous efforts. For starters, she spends a lot of time buried beneath this dark coat. The details are interesting: I enjoy the assertive use of piping, the broadness of the cuffs and collar, and the sturdiness of the fabric. The purple is a little too deep, though, bordering on black in a way that diminishes the impact of almost all of the creative flourishes on the garment. The pin thus becomes the only real focal point, stealing more attention than it needs to because there's simply nothing else to look at. Look at the range of emotion. 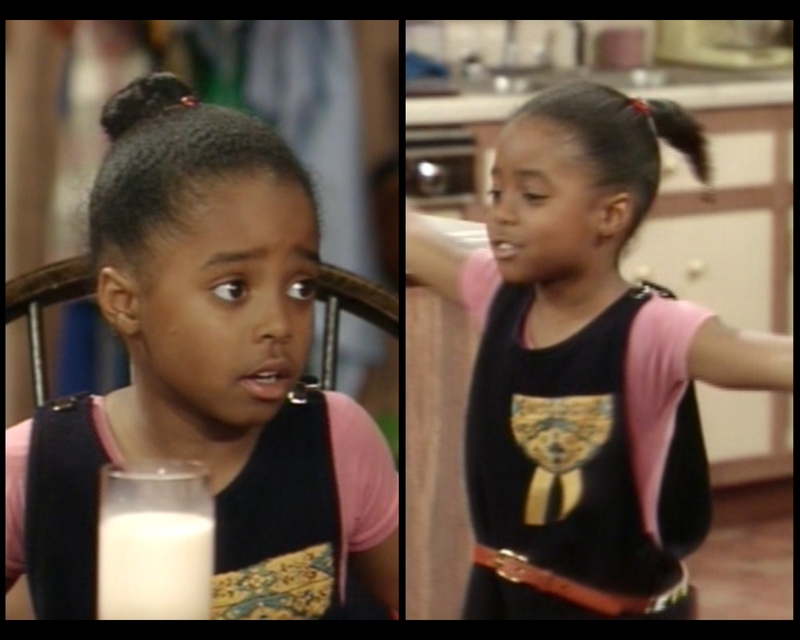 These two frames should be on her reel. She gets a second outfit, but it's clearly a stay-home-and-study look: a practically colorless sweatshirt with her horrible spider pants first seen in episode #2.7. Barely worth mentioning. That topknot is so freaking cute! Rudy begins in a full-on tie, which is weird mostly because she's not planning on leaving the house in this outfit. Why so formal for a staying-in ensemble? By the time dance rehearsal comes around, she's switched to a more casual top. Honestly, I think the sun's dance looks pretty boring from her demonstration. 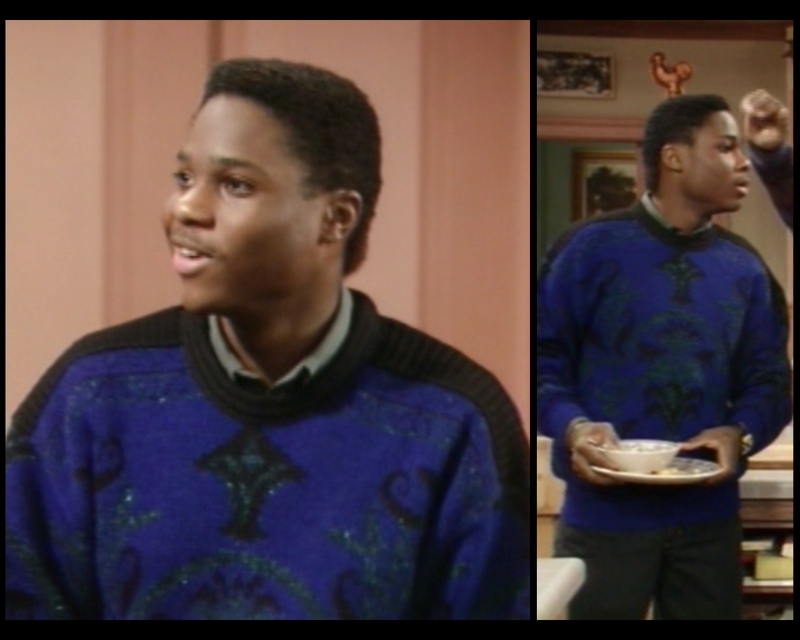 Same jumper, same belt, new shirt. A little weird, yeah? I guess she's got her leotard on under there, but didn't want to leave the house in just tights. There's a logic to it. Tights are not pants. (Even a child recognizes that. Do you hear me, modern-day Brooklyn? TIGHTS ARE NOT PANTS.) There is no logic, however, to that ghastly pocket or the pairing of a sienna belt with a black outfit. Her instructions on the proper bow are actually kind of great. I wouldn't say that I enjoy Vanessa's outfit, but I think she's improving. The restriction of her color choices to red and black instantly increases the maturity of her presentation. It's no longer a haphazard gathering of pastels and jewel tones: she's looked at this with an editorial eye and found ways to simplify. Though she still displays her love of prints, they're subdued by her standards, so that's another step in the right direction. Her greatest strides, however, have come in her understanding of proportions. She looks great from all angles, which is a rare achievement in this house. As Vanessa emerges into womanhood, she has to learn how to dress a new body, and today is a day of discovery for her. That upside-down corset around her waist does wonders for her hips and behind. At the same time, she's got everything hidden under bulky layers of cloth, so she gets to play with her figure without suggesting an overt sexuality that would be unfit for her age. I think the elements merge rather well here: she gets the best of both worlds with a combination of childish and adult stylistic approaches. I approve. From now on, spend more time observing your mother. 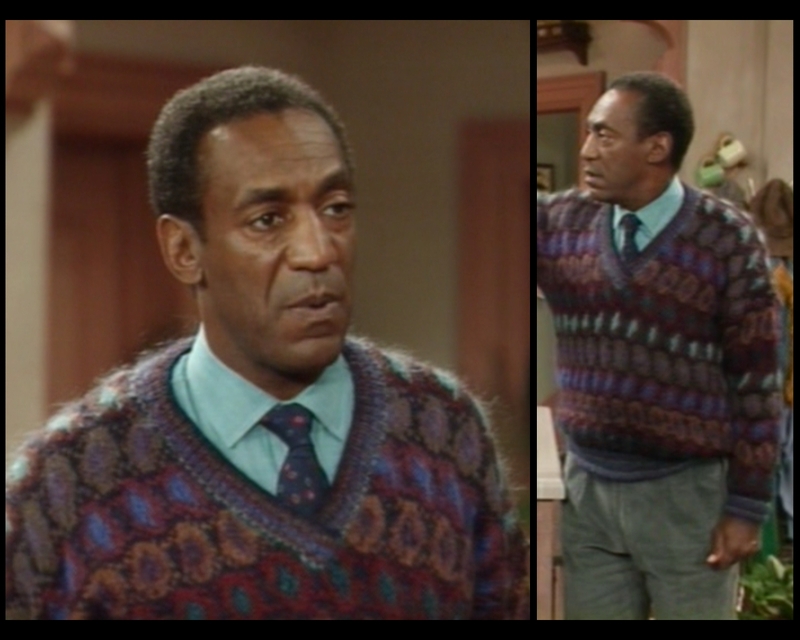 And you thought only Cliff could wear Cosby sweaters. Nope, they're fun for the whole family. 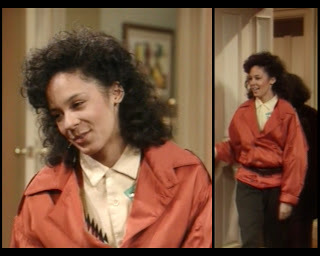 Actually, this look draws inspiration from two other family members as well: Denise wore similar pants during the first season, and the high collar on that shirt is reminiscent of one of Sondra's early looks. Let's just say that I liked her first outfit better and leave it at that. 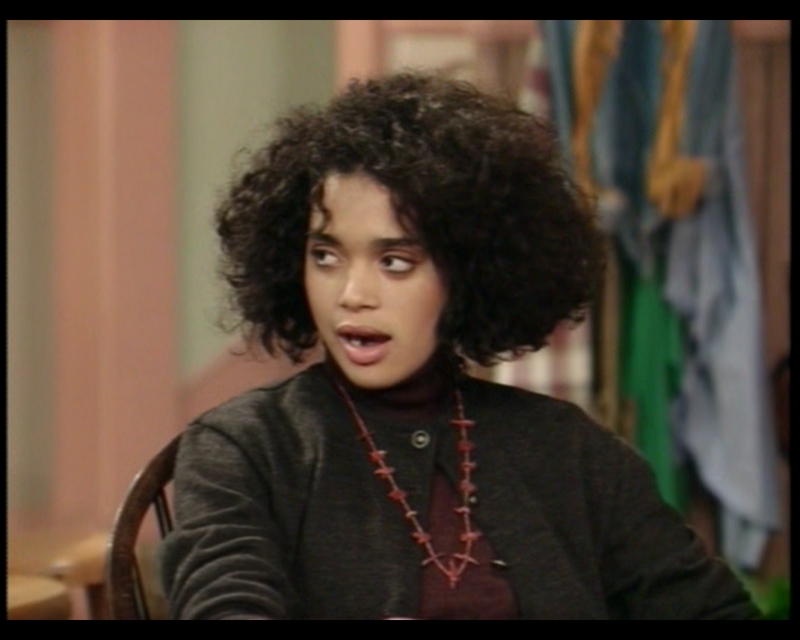 I'm running out of creative bitchiness, and it feels better to be nice to at least one Huxtable child per episode. Even when they make that task extremely challenging. How do I even stay awake through his scenes anymore? Theo is on a mission to bore me to death this season. At this rate, I'm going to end up giving Rudy a full rundown and ignoring this dude instead. Seriously, there's nothing to comment on! Dark palette with little variance? Check. 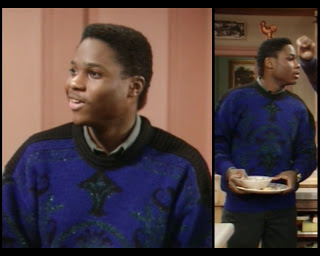 Boxy sweater with a vague tapestry pattern? Check. Dark, relaxed fit jeans? Check. It's like the dullest items from his closet were put in a Markov generator. I GET IT DRUGS ARE BAD LEAVE ME ALONE. 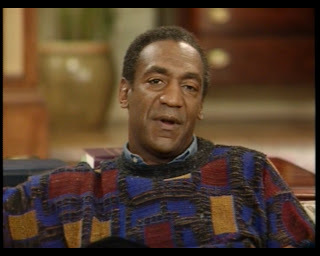 Oh, I forgot: the DVD includes (because, I assume, it was included when the episode first aired) a brief opening statement from Bill Cosby reminding children that drugs will ruin their lives and destroy their families. 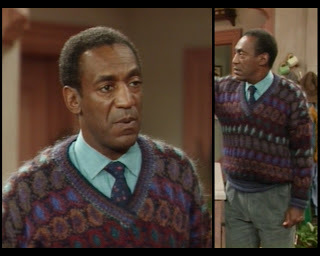 During this heartwarming address that has absolutely no connection to the week's storyline, he wears his episode #3.4 sweater. During the proper episode, he sports a peacock tail made of cat hair. It's the kind of thing that only he could pull off, and really the kind of thing that only he would ever attempt. I shouldn't enjoy that sky blue shock through the middle, but he saves it by matching his shirt so perfectly. It's a mess that somehow becomes beautiful in the doctor's capable hands. But don't hug him. It'll get all over you, and if your earring gets caught in it, the whole thing will unravel. And frankly just looking at it makes me itchy. I'm really going to type it in all caps for the entire season, so you may as well accept it: HOW ARE THEY HIDING PHYLICIA'S PREGNANCY THIS WEEK? I prefer not knowing what prompted this reaction. It's a standalone. By keeping her in bed all day with a pinched nerve! "Do you guys have any more crap to bury her under?" They really use every trick in the book here. 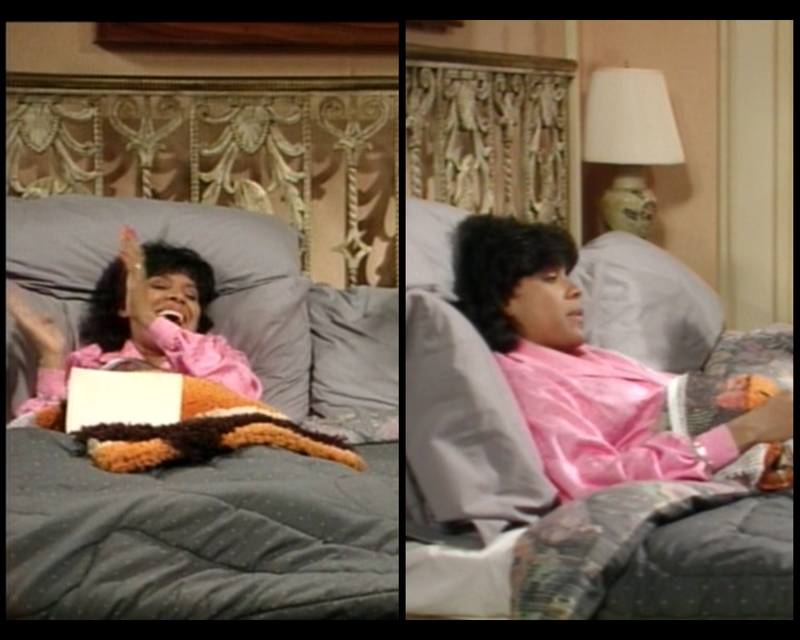 In addition to maintaining her horizontal-ness in all scenes, they drape that latch hook project over her and give her a newspaper to read. Things are getting out of hand. We're soon going to have to resort to episodes where Clair goes to the beach and gets buried up to her neck in sand or gets caught in a blackout or something. Thank you, all of you, for continuing to read this blog. If you've enjoyed it, please consider donating a dollar to help me keep it running. If you don't have a dollar to give or simply don't feel like giving it, you can also help by spreading the word. 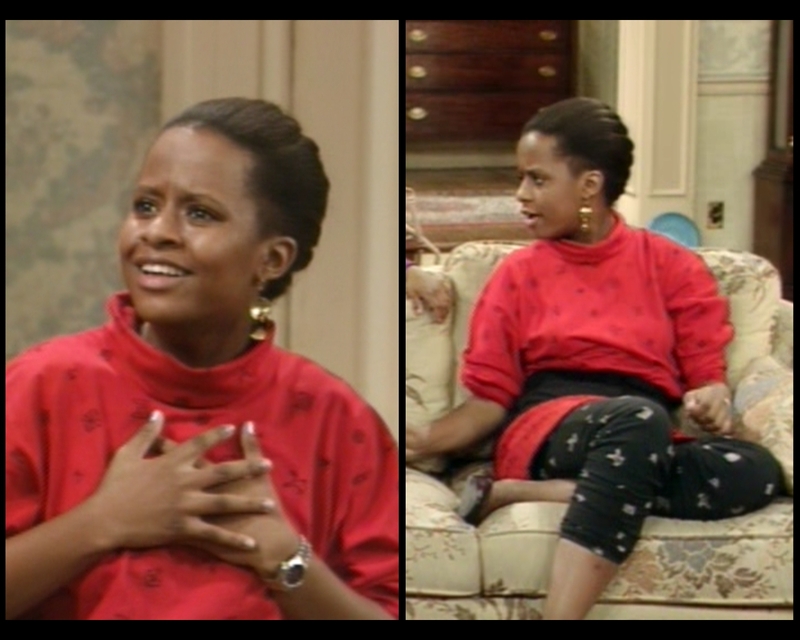 The internet is big and it's tough to stand out, so posting a link somewhere or talking about Huxtable Hotness at parties or hiring a plane to write the URL in the sky can make a huge difference. I could use the help. Again, thanks for sticking around. Let's meet up again next week and do this again. This article truly made me LOL, especially with your highlight of Cliff's 'disclaimer' - LOL... 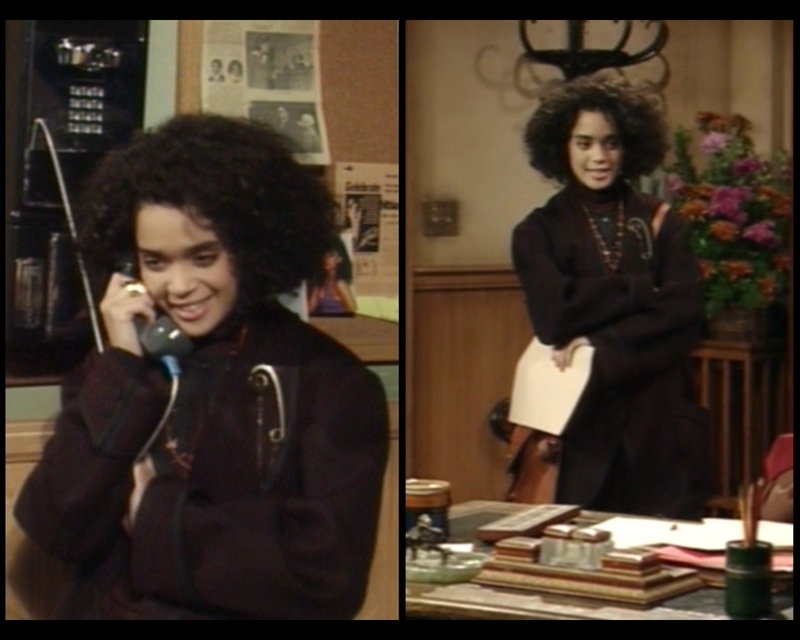 I think that Denise and Sandra both look super thin, more so than they did in the original episodes. 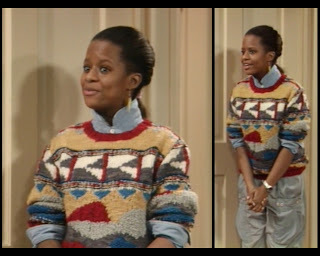 And thin is what counts... even when it pertains to Huxtable hotness. As much as I love you, I shall NOT be donating to you, because you have not yet earned it. What do you feel qualifies an earned ad resource? yogaduchess1982, the decision as to whether I have earned your $1 is not mine to make. I opted for a donation button as opposed to ad revenue because I thought that ads would be uglier and more distracting. Every week, I spend hours creating new content entirely for public enjoyment, free of charge; I consider the donation link to be something of a tip jar. I've been writing this blog for nearly a year now, and have two years left before the project is finished. During that time, it'd be great if enough people donated a dollar that I could cover the cost of a) the DVDs and b) three years' worth of domain name ownership. I'd love to spend more time updating the blog in a cosmetic sense, researching fashions more thoroughly, or writing even longer and funnier entries, but since this currently qualifies as a hobby for me, I sometimes have to prioritize this space below my full-time job and other artistic projects. I guess the question should really be turned back to you: you read this site regularly, laugh at my jokes, and "love" me, but your professional opinion is that I haven't earned your donation. As someone who has amassed a larger following than me on the internet, what do you think I need to do to convince more people that this site is worth a buck? And thanks so much for the Facebook and Twitter support. Getting eyes on this page is more important than getting a dollar in my PayPal account. ^^^This comment right here is worth $5 all by itself. Thank you for the reply! Much appreciated! I suggest that you read Gary Vaynerchuk's "Crush It." It was my guiding light for earning readership. It's a super quick read. As an objectivist, I do not believe in tip jars. But I shall absolutely continue to read and post your link to my blog! Hey guys, the comments section isn't a great place for personal arguments. I'm generally opposed to deletions, but I'm cutting this off before it gets out of hand. Everyone calm down. As a professional artist for over 20 years now, I find the most important thing for artists alike is to show appreciation for another and boost the support for other artists. We all share the same community of not being as appreciated simply because we are artisans that culture and society forgot. Our job, whether musician, painter, professional writers,etc., is to teach people how to not only respect art and creativity as a whole,learn from it, (in whichever way they perceive it) but boost individuals making a better name for our craft in general, because it makes us all benefit. I find the creative wit in this blog worth more than a dollar, and just by the comment above can see the person isn't worth two cents. It's probably best that I encourage a cease-fire on the comments. Let's all just continue to focus on how brilliant my writing is, guys. Fascinating and funny! I used to watch this show. I saw on a reunion special that they also cut a hole in the bed this week to hide the pregnancy. Love the blog. I was hesitant, but now that I know one person liked it, I feel totally validated in my choice. Thanks! I found your blog on the Huffington Post (via Cracked Linkstorm, so you can add a few more 'featured on' notches to your belt :) I can honestly say, wow...you've blown my mind. My biggest regret is that I sold my own Cosby DVD's on ebay a few years back (FULL series). I don't know what I was thinking...ok, I was thinking that I was poor, but that's beside the point. Had I known of this project and the glory within I would have donated the entire set to you with my blessing and thanks. I love this blog. 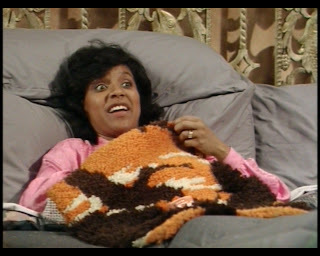 I love everything about it, and if I were an older woman your screencap of Sondra's 'adorable face' would have made me lose all bladder control. Well played, sir. I can't wait to make this my regular Monday check-in spot, and I will be spreading the word to all of my friends, including my best friend who is a scientist, and has dedicated a large portion of his life to the subtle nuances of the Cosby quarter smile. Brooke, so glad to have you on board! And don't worry about the box set: I'm only sad about it because now you can't watch the show as you read the blog. If you keep reading, I'll do my best to keep making these entries readable. Thanks! I found your blog on HuffPo too! Since I love the Cosbys, fashion, and biting wit, it was only natural that I'd appreciate your writing style! Don't worry, Anonymous, it wasn't even good internet drama. (And I know good internet drama.) All I deleted was low-grade playground squabbling. Anyhow, so glad you enjoy the site. I'll try to keep up the good work. I donated to offset the crazy above! Also because you're awesome!